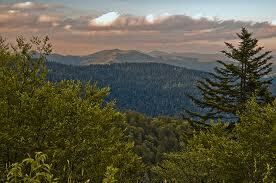 Fraser fir trees grow only in the southern Appalachian Mountains and about three-quarters of their native population is in Great Smoky Mountains National Park. They are grown commercially as Christmas trees and are highly regarded for their sweet fragrance. Since the 1950s, many trees have been killed by a tiny insect from Europe. The southern spruce-fir forest is the highest and coldest forest ecosystem in the Appalachian range, thriving in elevations above 5,500 feet where the climate is too harsh to support the broad-leaved hardwood forest that dominates the region’s lower elevations. A relic of the last Ice Age, this forest type covers just over 100 square miles, and is considered the second-most endangered ecosystem in the United States. Southern spruce-fir stands consist primarily of two needle-leaved evergreen species— the red spruce and the Fraser fir. Over the past two centuries, the southern spruce-fir stands have been decimated by logging, pollution, and a European aphid infestation. The southern spruce-fir forest is home to one endangered species, the spruce-fir moss spider, and several threatened species. While red spruce is common throughout North America, the Fraser fir— a relative of the balsam fir— is found only in the spruce-fir stands of Southern Appalachia. In the second half of the 20th century, nearly all of the mature Fraser firs of Southern Appalachia were killed off by the balsam woolly adelgid— a parasite introduced from Europe around 1900. 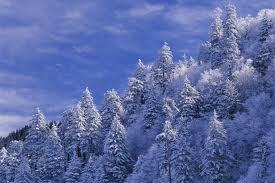 Come to the Smoky Mountains, near the town of Gatlinburg, Tennessee, and see the largest collection of “Christmas” trees in the country. The wildlife and landscapes to be seen are quite beautiful. You will truly enjoy your peaceful hike or drive through the Park!